The Sherpa Original Deluxe Carrier is the BEST Carrier for You and Your Pet! - Petpav - Your Online Magazine for All Things Pet! The Sherpa Original Deluxe Carrier is the BEST Carrier for You and Your Pet! When you are ready to take your beloved pet on a long road trip or on a plane flight, you want the best carrier for your pet. After all, traveling can be very stressful for your dog or cat. You want a carrier that is comfortable for your pet, has easy access and airline approved. The Sherpa Original Deluxe Carrier does just that and more! It is a well-ventilated, stylish pet carrier that is approved for most airlines and safe for your pet(s). What makes the Sherpa Original Deluxe Carrier so special? The Sherpa Original Deluxe Carrier is the ultimate carrier for pets on the go! This exceptional carrier is one of the most comfortable, durable, soft pet carriers on the market. Sherpa carriers were the first soft-sided pet carrier to be endorsed by major airlines and continue to be the industry standard for pet carriers. The Sherpa Original Deluxe carrier is designed for every breed of small dog and cats with its different sizes to meet your specific needs. The Sherpa Original Deluxe Carrier is approved for use on most major airlines, while the small and medium sizes are included in Sherpa’s Guaranteed On Board® program, which guarantees a hassle free experience for pet-toting travelers. Visit www.flygob.com to learn more. 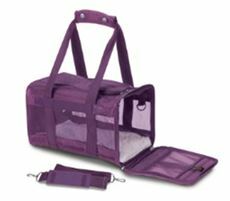 The Sherpa Original Deluxe Carrier has a top and side entry to make it easy to place your pet inside the carrier. It has mesh panels to make sure your dog or cat can breathe easily which is vital for your pet on the go. There are locking zippers, a rear pocket and padded hand carry straps so you don’t chafe your hand when you carry it. There is also an adjustable, no-slip shoulder strap to make carrying your pet that much easier. With its’ fabulous faux lambskin liner, the carrier is not only comfortable for your pet, but machine washable! The hardest part of going to the vet is being able to get your dog or cat in the carrier. With the Sherpa Original Deluxe carrier, you can easily place your dog or cat in the carrier and close it immediately. It isn’t as big and intimidating as the other pet carriers that your dog or cat runs away from when seeing it. As it is designed as more of a bag shape, your dog or cat is less likely to be intimidated by it. A lot of small dog owners hate to leave their little dogs at home when running errands. The Sherpa Original Deluxe carrier makes it easy to bring your pup with you. With its stylish look and comfort for your dog, you can bring your beloved with you throughout the day. 1. Small – 15” long x 10” wide x 8.5” high – ideal for pets up to 8 pounds. 3. Large – 19” long x 11.75” wide x 11.5” high – ideal for pets up to 22 pounds. Founded in 2010 by pet lovers and industry veterans, Quaker Pet Group is dedicated to providing the best quality products for pets and their pet-parents. Comprised of a portfolio of carefully chosen and industry leading brands, QPG represents high-quality, innovative, solution-based products and proprietary collections such as GoDog™, Silver Tails™, New York Dog™, Hear Doggy!™, Vet Tech™, Sherpa’s Pet Trading®, Fox & Hounds™, Cloak & Dawggie™, and SuperCat™ products.